How do lawn pests survive winter? 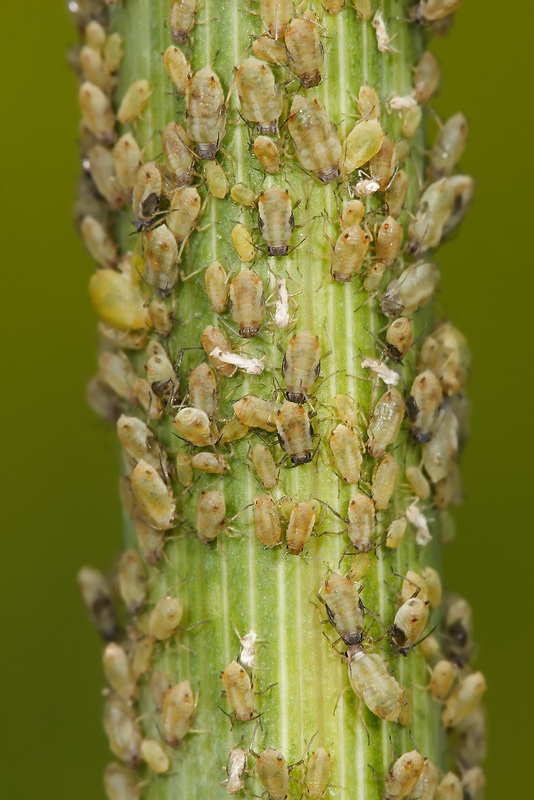 Aphids feeding on fennel… not a pretty sight! Insects survive winter in various ways: Some fill their body with glycerol (antifreeze), some slow their metabolism down just high enough to survive a term called diapause. Some as eggs, some as larvae and a lot of adult insects spend the cold winter months under ground after they have stored up fat like a bear that hibernates. There are types of butterflies that actually fly south (migrate) for the winter. Whatever the method they use to survive they are always here and a cold winter may slow them down but they will be back! Insects are cold blooded. Yes insects do have blood and a vascular system although not like ours. They are cold blooded and when it is cold they do not move well or at all. I have herd “we need a hard freeze to slow down the chinch bugs” and the following summer they are worse than ever. In the following paragraphs we will discuss some of our worst insects and how we here at Harmony Care plan for their return and what we have to do to control them. Aphids: A very common insect that can cause damage to your shrubs and annuals around your home. They are usually the color of the plant they are feeding on a very easy to identify. The female aphid will and can lay her eggs in an insulated area to protect them from the cold to where the insects hatches out in the spring. Also aphids are known as ant cows where the ants will actually move the eggs into their colony and protect them from predators and the elements until spring arrives, where they will move them to a plant for them to hatch out and start producing honey dew which the ants feed on. Sod Webworms: Half grown worms in the winter live in tunnels that are silk lined underground or in heavy thatch where they lay just waiting to come out and munch on your lawn. Usually they emerge around April and then the feasting begins. There damage looks like someone used a weed whip or just shaved small areas in the lawn. They hide during the day curled up and start feeding at night. Chinch Bugs: Ya I said it. Chinch bugs, probably the most destructive insect in Florida lawns. Costing millions of dollars to home owners each year in sod repair and insecticides. Chinch bugs in north Florida can over winter in a dormant stage, but mostly stay active all through the year by staying way down in the thatch layer or just under the soil dodging the cold. Then spring times comes and they re-emerge in the same area they were when winter came. These pest move together as a family or collective at once, sometimes covering hundreds of feet in less than an hour. Some do and can fly but this is not the main way of traveling. Then the hotter it gets the the better they like it and the destruction begins. In mild winters here in Florida we have found them all the way into December and re-emerging in February. In South Florida they are year around. Those are just a few of the insects that we deal with here in Florida with the aphids being the easiest to control to the chinch bug being the most difficult. The reason that has occurred is that for years lawn companies have used the same insecticide such as Bifenthrin to combat these creatures. It was and is used so much some of the insects have built up a resistance to the insecticide. That’s why here at Harmony Care we rotate our insecticides constantly and sometimes on a monthly basis. By doing this we keep the insects off balance and actually break the life cycle thus preventing resistance. One reason some companies use the same insecticide is cost. It is expensive to use different insecticides but in the long run well worth it. Let’s face it, the insects are here to stay. We can control them with control being the optimal word. Control means we keep their numbers at a level that the grass or plant can survive and look healthy. With our program that provides proper nutrition and communication with skilled professionals like our Personal growers and proper communication with the customer and our office we can keep your lawn and landscape looking good.